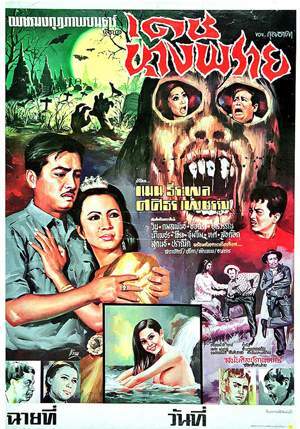 This Sasithorn Phetrung movie page contains 7 records. 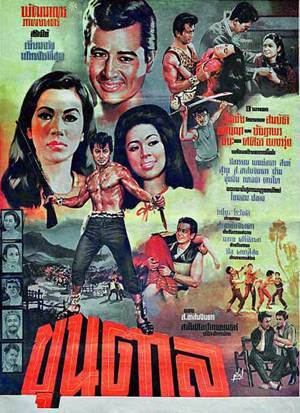 Thai movie คฤหาสน์รัก was released in year 1969. It is a 16mm format movie and lasts 2h05mn. Main actor is Luechai Natnat and main actress is Petchara Chaowarat. A Chinese vendor faces ghosts coming to eat at his shop. Even the police faces ghosts when patrolling at night time. Those lengthy comic sequences last more than 40 minutes. Policemen call their boss, Luechai Natnat, to investigate. While entering in a haunted house, Luechai is greeted by a beautiful lady (Sasithorn Phetrung) in Thai traditional dress and then by Petchara Chaowarat. Then Preeya Roongrueng brings drinks. The other policemen discover Preeya is a ghost and her other friend, a vampire. 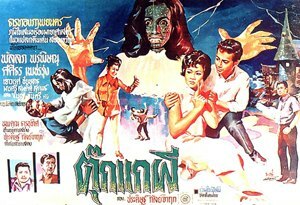 The woman wearing a Thai traditional dress, Sasithorn Phetrung, is also a ghost. While taking a picture, it is discovered that Petchara is also a ghost. Finally Luechai is also aware. The house is fully haunted. Another real Petchara is coming from airport. Policemen including Sukon Koewliam get confused between Petchara 1 and Petchara 2. It is disclosed that Petchara 1 and all house's inhabitants were killed by ruffians. Veteran comic actor Sithao Petcharoen is also playing as spirit house ghost. Petchara 2 is captured by the same ruffians to force her to sign a document but she refuses. Finally Luechai is informed that Petchara 2 is held captured. Police storm the house but ghosts (including Pipop Pupinyo) already took their revenge. During a final duel between Luechai and Tawan Siriwat, Petchara 1 strangles Tawan. All ghosts have to quit this world being called by the king of hell. 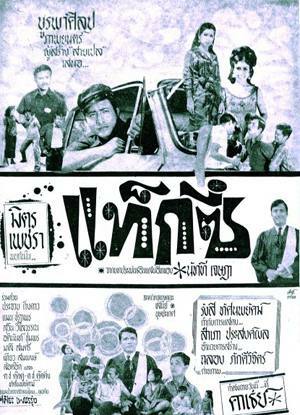 This small movie features Luechai Natnat as main actor at a time the main popular actors were Mitr Chaibancha, Sombat Methanee and since many years. Horror movies from decade 1960s despite missing FX effects still have a nostalgic feeling of forever gone era. 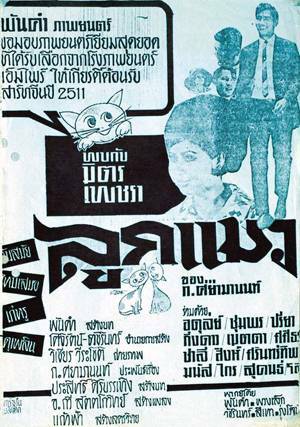 Luuk Maew (ลูกแมว) is a movie released in 1968. Only 38mn are left and there is no sound as the movie was in 16mm format. With only part of the movie available and no sound, it is difficult to understand the whole story. Mitr Chaibancha’s mother would like his son to marry Petchara Chaowarat, who is the daughter of Princess Pa, as she is hoping for a dowry to pay her debts. Mitr is not convinced as he doesn’t know Petchara. One ruffian relative (Choomporn Theppitak) of Princess Pa wishes to kill her and Petchara to get the family heritage. Petchara gets shot and falls in the sea. 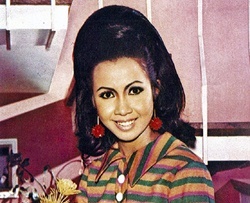 Petchara's nickname is Luk Maew (ลูกแมว), i.e. the name used for the movie title. Petchara gets some help from doctor Adul Dulyarat. As Petchara has disappeared, the mother has already a new plan to marry Mitr to another niece of Princess Pa, i.e. Kingdao (กิ่งดาว ดารณี). While visiting a school, Mitr is hurt by a ball sent by Petchara. They meet for the first time. Mitr brings Petchara back to his home. Petchara shall be the baby-sitter for his disabled niece. In the home there are already Mitr’s mother and her two daughters Metta Roongrat and Preeya Roongrueng. Petchara is not welcomed. A long discussion between Mitr and Adul happens following a checkup of the child. The ruffian relative threatens Metta following a night she was drunk. Petchara recognizes the ruffian who shot her and flees from Mitr’s home. Petchara is kidnapped. Krai Kanchit helps to release Petchara. The grandfather separated with his wife also tries to help the child. Finally the little girl is reunited with her mother Preeya. The director is popular director Phan Kam. Actress ศศิธร เพชรรุ่ง has also a small role.